One of the UK’s leading dewatering and water treatment specialists, with more than 20 years experience providing bespoke systems for customers. Project Dewatering Ltd are owned and fully supported by Holscher Wasserbau GmbH, Europe’s Largest Dewatering contractor, delivering over 800 projects each year. Project Dewatering Ltd have recruited a number of recognised industry experts to ensure that you are provided with the best available solution to your problem, whether a need for dewatering, water management or the installation of wells. Project Dewatering Ltd can provide a number of unique items of specialist plant including drilling rigs capable of installing large diameter boreholes (up to 2 m) and trenchers that can install up to 1 km of deep horizontal drainage pipe per day. Part of Europe’s largest dewatering company, offering you professional, cost-effective and bespoke industrial dewatering solutions for groundwater control and treatment. Cost-effective groundwater remediation solutions using state-of-the-art equipment for construction projects. Specialist services for installing in-ground infrastructure for Ground Source Energy Systems and thermal testing of Ground Source Energy Wells. Extensive range of water pumps and water treatment equipment for hire to service your dewatering, water treatment and monitoring needs. Project Dewatering is a leading UK dewatering and groundwater management solutions provider, with commercial dewatering, well drilling, water treatment and groundwater remediation expertise on construction projects throughout the UK and Europe. Project Dewatering Limited is part of Hӧlscher Wasserbau GmbH, Europe’s largest dewatering contractor, who have over 60 years of experience and are active on over 1,000 construction sites every year. Our experience with pump monitoring and control systems allows us to provide pump tests, automated groundwater treatment and remediation. Our borehole pumping system knowledge can also be used for commercial open-loop, ground source energy schemes, and thermal response testing for closed-loop wells. We have an extensive track record of providing commercial dewatering equipment for hire, including industrial dewatering pumps and water treatment plant. In addition we are able to provide design, planning and testing for dewatering systems as required. 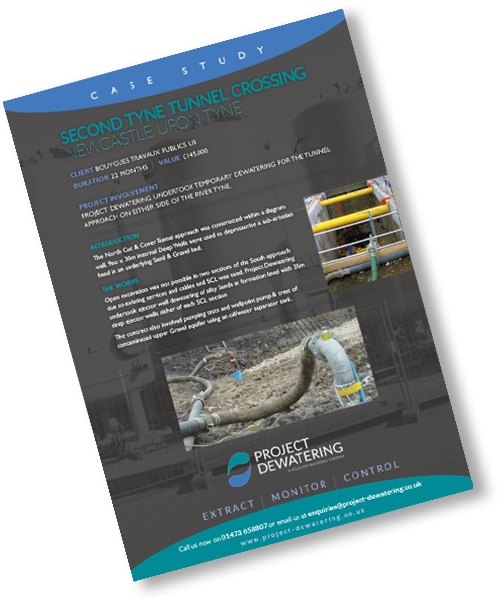 Project Dewatering has a long-standing reputation for delivering groundwater dewatering management to large scale infrastructure projects. Our team has over 150 years of commercial experience working on high profile projects throughout the UK, Republic of Ireland & Europe. At Project Dewatering, we're experienced in domestic and small-scale groundwater dewatering systems, whether that's dewatering basements, deep wells or well drilling. We design, install and maintain cost-effective dewatering services specific to your site and ground conditions.